The Vegetation Studio Manager Component is a manager component designed to keep sync between all Vegetation System components in one scene. You would use multiple Vegetation System Components in scenarios with multiple terrains and/or cameras active. It also has an API to control one or multiple Vegetation Systems run-time. Set new vegetation packages. Vegetation Density etc. Adding and removing Vegetation Masks are also done using this component API. 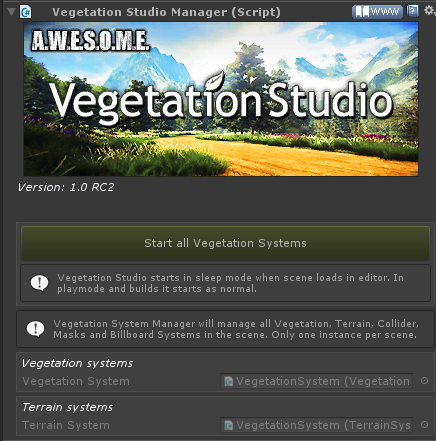 To create a new Vegetation Studio Manager Component select “Window/AwesomeTechnologies/Add Vegetation Studio” from the menu in Unity or drag the “VegetationStudio” prefab from “AwesomeTechnologies/VegetationStudio/prefab” folder to the scene. There should be only one instance of the Vegetation System Manager component per scene. All Vegetation System components in the scene will auto register with the Vegetation Studio Manager Component and listed here. All Terrain System components in the scene will auto register with the Vegetation Studio Manager Component and listed here. All Vegetation Masks in the scene will auto register with the Vegetation Studio Manager. The manager will then make sure all VegetationSystems have masks assigned and removed as needed. VegetationStudioManager has an external API to refresh vegetation when Terrain Data is changed. It will manage multiple VegetationSystem and TerrainSystem components in the scene.